Everyone seems to be speaking about skin tone nowadays, whether it is for makeup, clothing or even jewelry. With pearls in particular, it can be pretty difficult to know what to look for. With so many colors to choose from – whites, blues, greens, silver, gold and even black – how do you know what’ll look best with your skin? Fair – Very light colored skin. Too much time in the sun could leave you burn and red. Light – Another light colored skin tone but with more light brownish undertone than fair. Sun exposure also tends to be an issue. Medium – Think olive. You probably don’t burn easily. Skin undertones are further categorized as cool, warm or neutral. If you have a pink or a bluish undertone, then you fall under the cool category. If your skin has a yellow, or golden undertone, then you fall under the warm category. Finally, if your undertone has a natural color, you have a neutral undertone. The undertone affects the overall color of your skin and hence it is important to take it into consideration. Fair skin tone – Light pearls work well with fair skin. Pink and peach are also a solid choice if your skin is on the lighter side. They’ll provide a subtle pop of color. 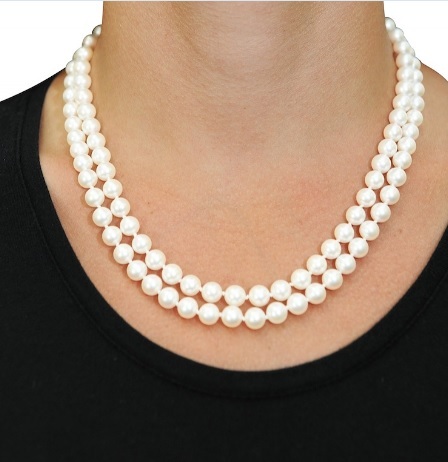 Light skin tone – Pearls that reflect light and light up the skin, such as the South Sea pearls, are a good choice. Medium skin tone – A golden color works great with medium skin tones. If you are more on the olive-side, try shades of silver, too. For an edgier look, try black pearls. Dark skin tone – White and bright colors really stand out against dark skin tones. Don’t shy away from pinks, golds and whites. Dark green and blue pearls tend to look good on all skin types. And try to remember: This isn’t an exact science. At the end of the day, fashion and accessory choice is ultimately up to the individual. The ones you like will be the ones that look good on you. This is true not just for pearls, but any fashion accessory. As the old saying goes, if you don’t like it in the store, you’re probably not going to like it when you bring it home. Be confident about what you’re purchasing. Make sure you absolutely have to have it! And finally, it is believed that you do not choose the pearl, the pearl chooses you. That’s what makes it so fun, after all!